Twenty-three-year-old Adem Adamend has it rough. His name is ludicrous. His friends are few. And the only thing his "kid genius" status has gotten him at the Interdistrict Bureau of Intelligence is a boatload of extra work with no credit in sight. Then hotshot lawyer Victor Manson is burned to death in his own back yard, and Adem finds himself using his unique skills to piece together the strangest crime he's ever seen. Strange because the only possible suspect Adem can pin the murder on...is a mythical beast. A dragon. Before Adem can unravel the mystery of Manson's death, the Bureau loses jurisdiction to the secretive EDPA, an organization that investigates weird and deadly events. But Adem isn't one for giving up, so he takes it upon himself to delve deeper into EDPA's machinations, into the series of unfortunate events that led to Manson's demise. And what he finds may change the way he views the world -- and himself -- forever. What do you do when a killer can hide behind his dreams? What do you do when a murder weapon ceases to exist? And how do you stop a villain who can conjure up nightmares and burn you from the Earth in the blink of an eye? Adem Adamend is about to find out. 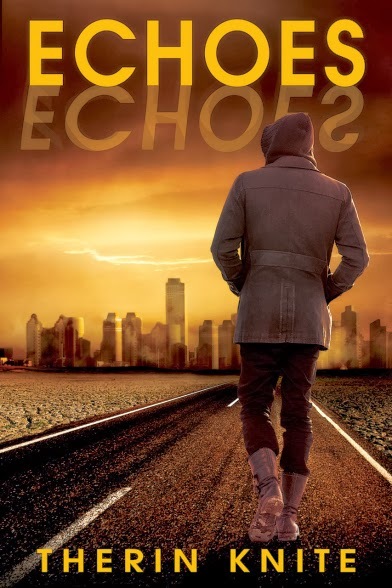 Echoes is an action-packed sci-fi mystery, full of twists and turns! Not quite enough futuristic elements. While there were definitely some interesting futuristic sci-fi elements in this book, I could have used even more! Besides a few interesting gadgets and people who change their appearance using mods, life in 2712 didn't seem that much more advanced. Dry wit. Adem's narration is filled with a sort of dry wit. In some ways, it reminded me of Douglas Adam's Hitchhiker's Guide to the Galaxy (or maybe his Dirk Gently series), but a lot less wacky. Adem is constantly parenthetically commenting on the circumstances around him in ways that made me laugh - a big plus in my book! Echoes (dreams). I'm not always a big fan of straight-up mysteries or crime novels, but the slightly paranormal/sci-fi element of this book is what made it for me. You see, you find out relatively early on in this book that the murder is not just any murder (you may have gathered that from the fact that it says in the synopsis that the murder was committed by a dragon). Adem discovers that the real culprit behind the murder is able to manipulate his dreams - and make them come to life. The result is a true nightmare! There were quite a few twists and turns in this book as Adem tries to solve the murder (coming very close to death several times). One of the major twists, I did see coming, but another one was a big surprise to me and I thought it was brilliant! I would highly recommend this book to fans of sci-fi or crime novels/mystery (who don't mind a sci-fi element). I give it 4.5/5 stars. Therin Knite is a 22-year-old college senior who occasionally writes speculative fiction and has the odd delusion of literary stardom. Knite lives in a humble little place known as the Middle of Nowhere, Virginia and spends every possible second of free time reading books and writing what may possibly qualify as books. It was really good! Good luck in the giveaway!! Sounds like a good book. I love it when a book can make me laugh! Totally agree. A sense of humor can totally make a book for me! Therin follows my blog and I just bought this. So glad you enjoyed it! I will definitely make time to read it soon. Oh, good!! I hope you love it!! This one sounds really good, I'll have to add it to my to read list on Goodreads. I don't know if you're familiar with the tv show Fringe (which is finished unfortunately) ? The description of this book kind of reminds me of it. It is one of my all time favorite tv shows, so ofcourse I'll have to read this book. I love sci-fi as well as mystery novels, so this sounds like something I would really enjoy. Thank you so much for sharing! Actually, yes - I loved Fringe! I think that Echoes would have fit into that show perfectly!